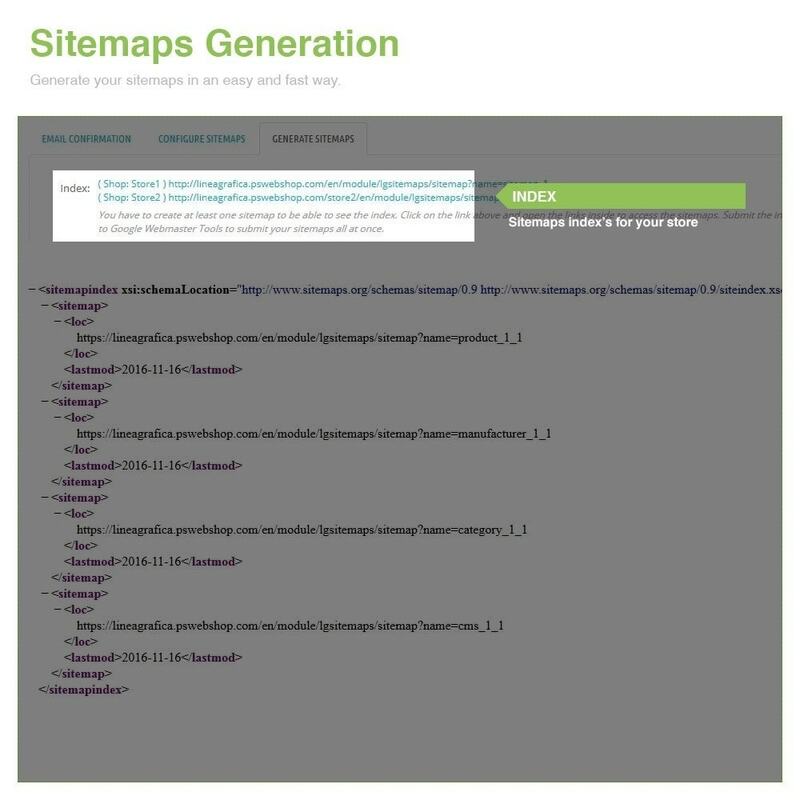 Improve your shop SEO by generating a Sitemaps! Index your shop urls in the search engine (Google, Bing, Ask) quick and easily. 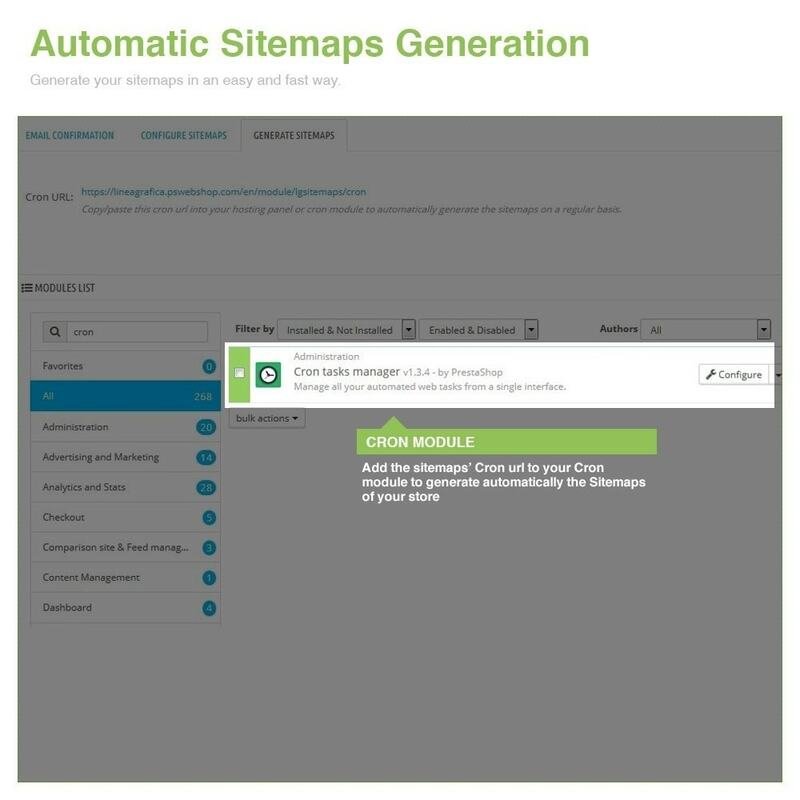 With our module, you can automate the generation and configuration of your Sitemaps, so you do not have to worry about. 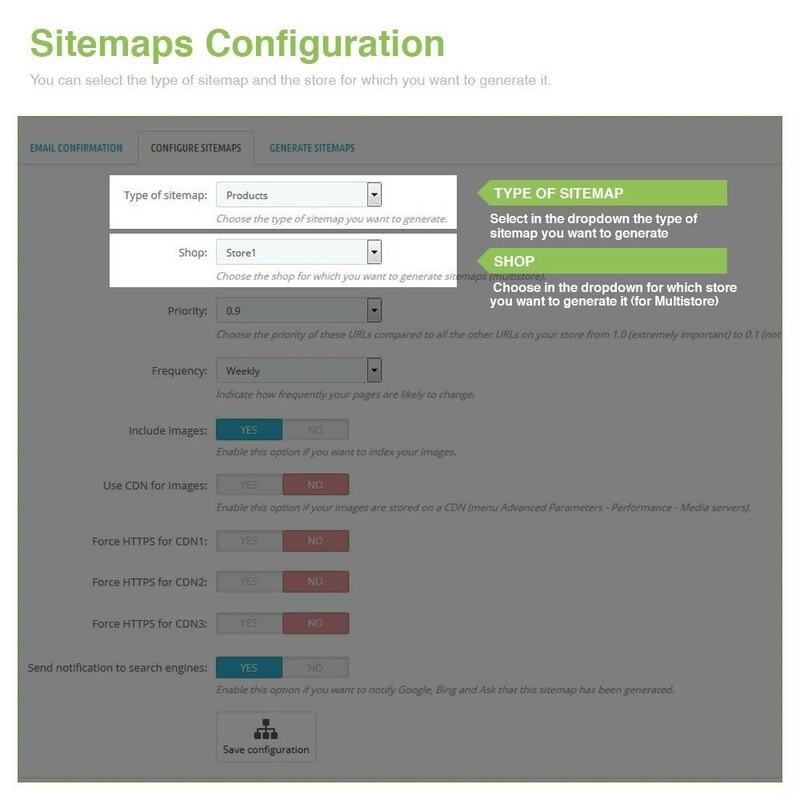 Configure each type of sitemap separately. 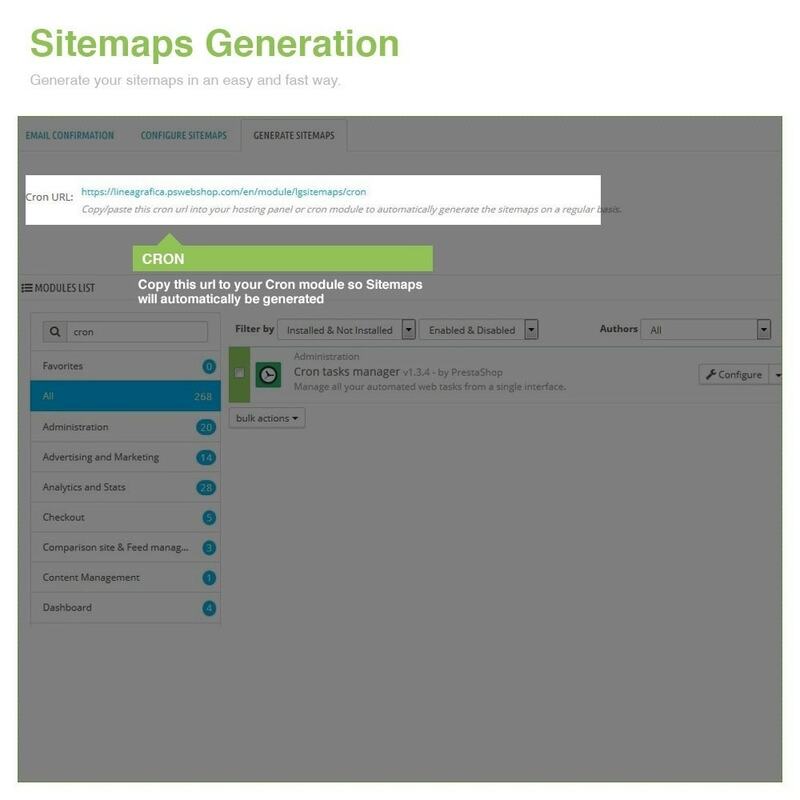 Click on the button "Generate" and the sitemaps are generated automatically without overloading the server and without timeout problem. Perfect for large, medium and small catalogues of products. 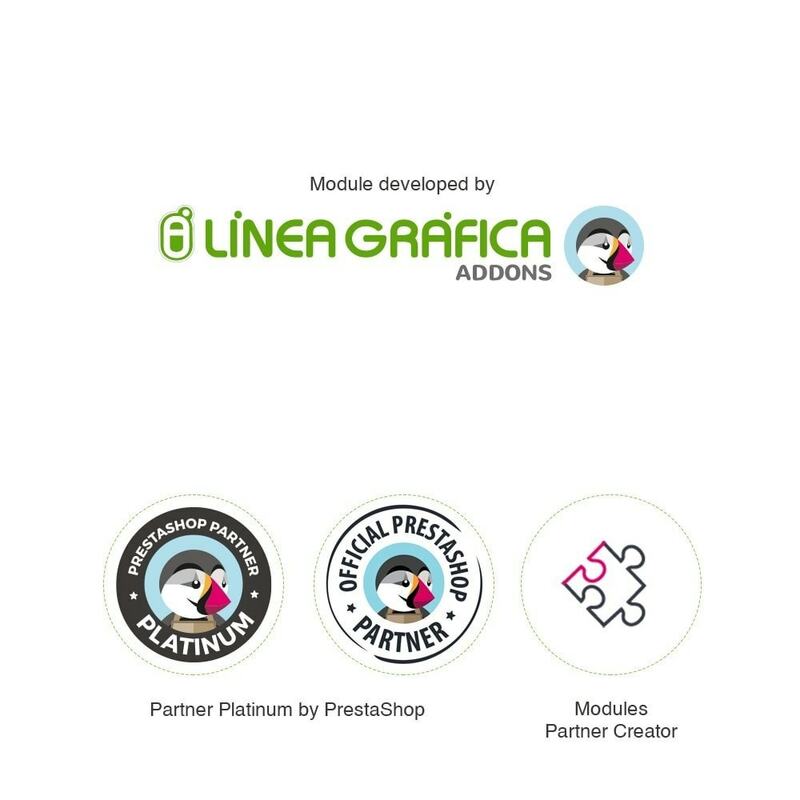 This module is compatible with PrestaShop monostore and multistore system. 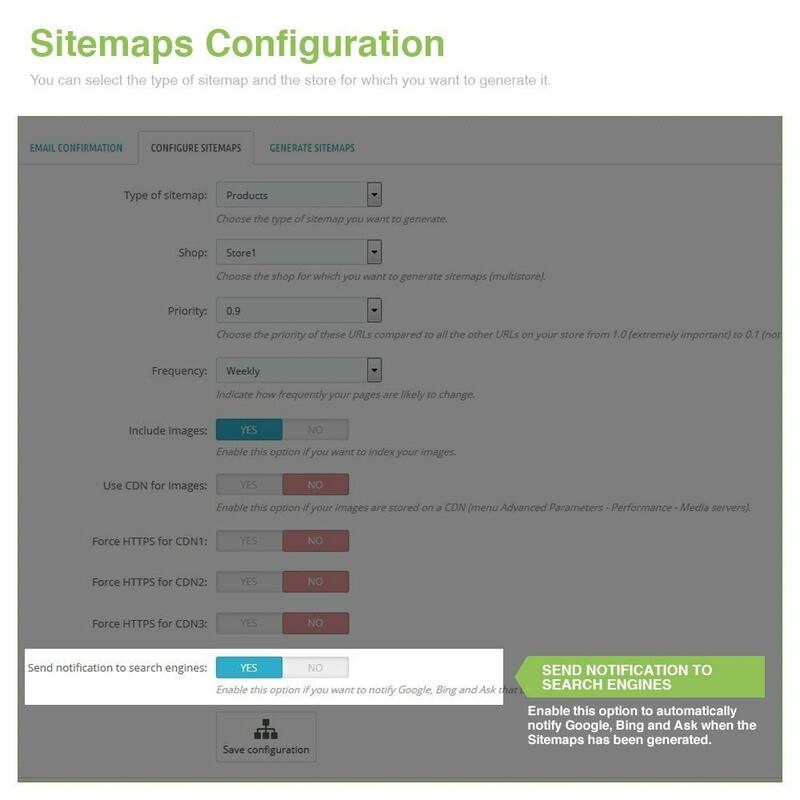 It automatically detects all your stores and allows you to easily generate sitemaps for all of them. Please note that the module generate different sitemaps by store, each store has its 4 own sitemaps (Products, Categories, CMS and Manufacturers). 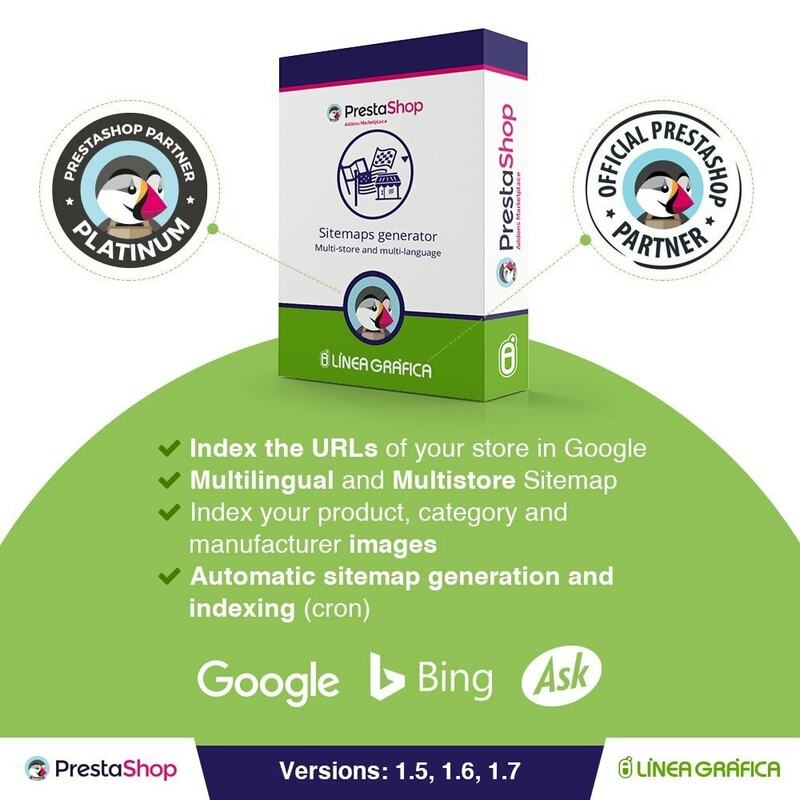 Our module allows you to create sitemaps in all the languages of your store so that you can easily improve the SEO of your store in several languages. 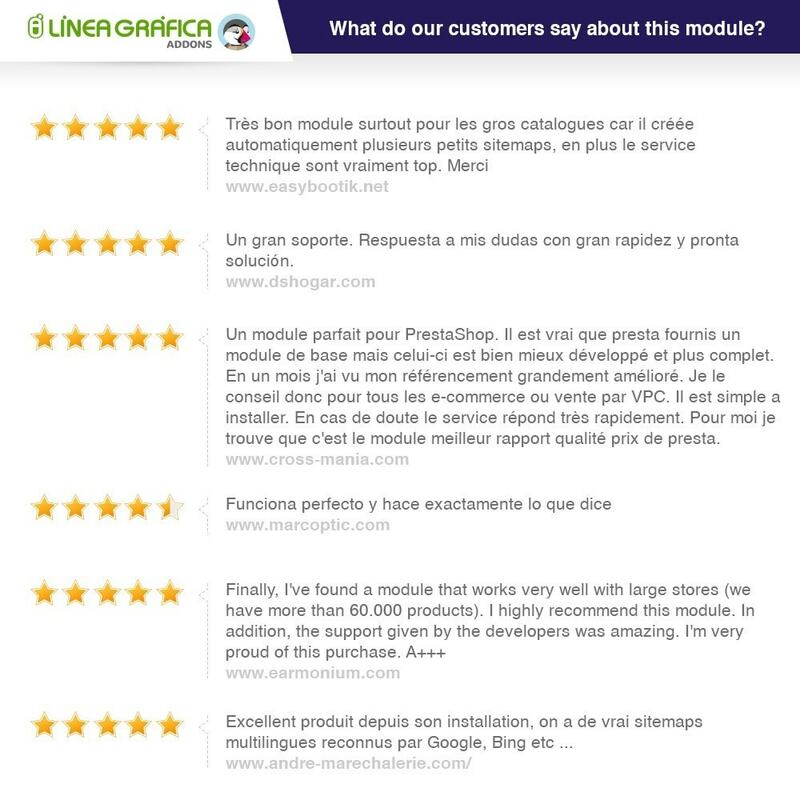 For each type of sitemap (products, categories, CMS and manufacturers), the module generates one sitemap that includes the URLS in all languages, as recommended by Google. 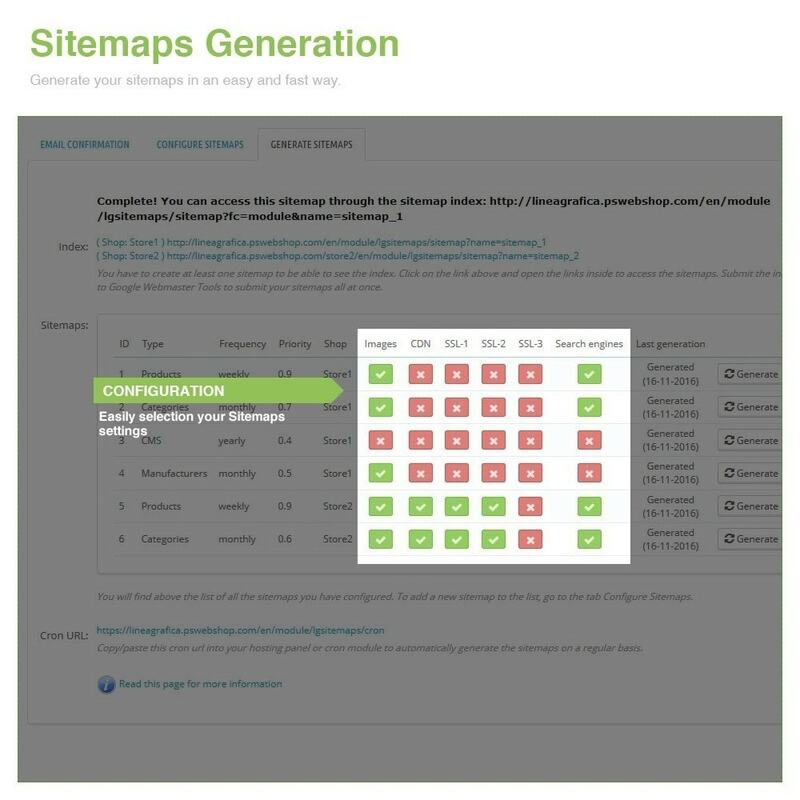 Our sitemaps are based on Google official guidelines so that you get the best SEO results. Another feature of our module is the possibility to include product, categories and manufacturers images into the sitemaps so that Google can index them. It makes your store visible and accessible from Google Image Search, which automatically increases the visibility of your store. 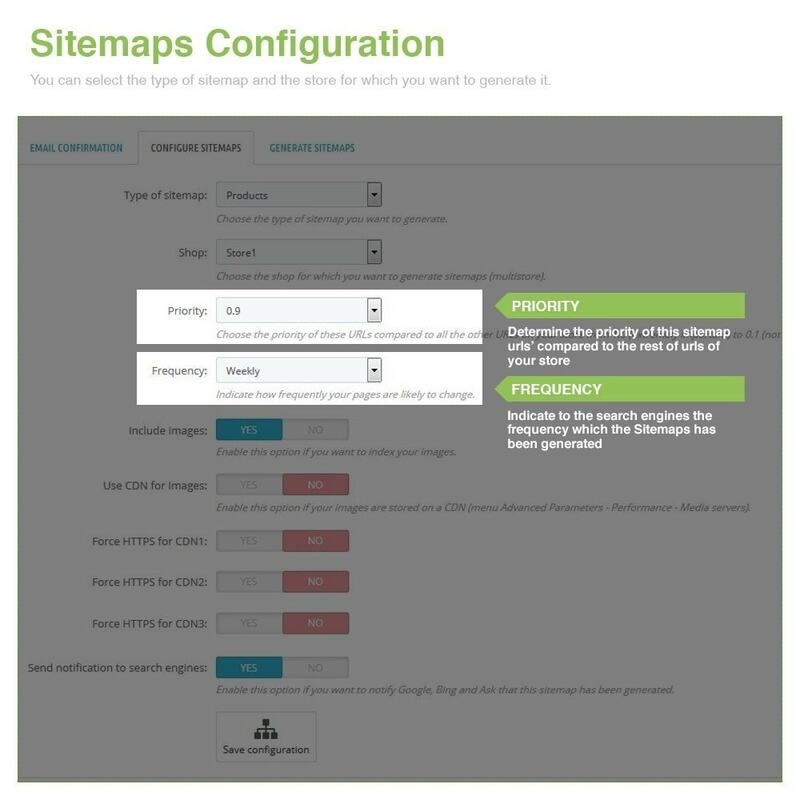 The module automatically creates a sitemap index to make it easier the management of your sitemaps, as recommended by Google. 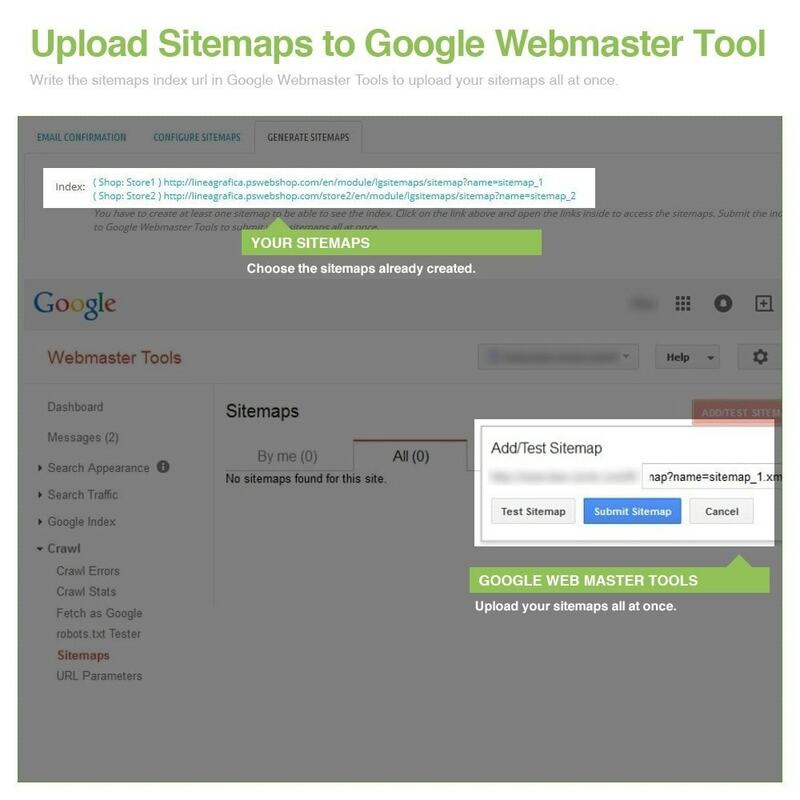 The index contains all the urls of your sitemaps, you just need to enter the url of the sitemap index into Google Webmaster Tools to submit all your sitemaps at once. Our module can create sitemaps for all sizes of catalogues. 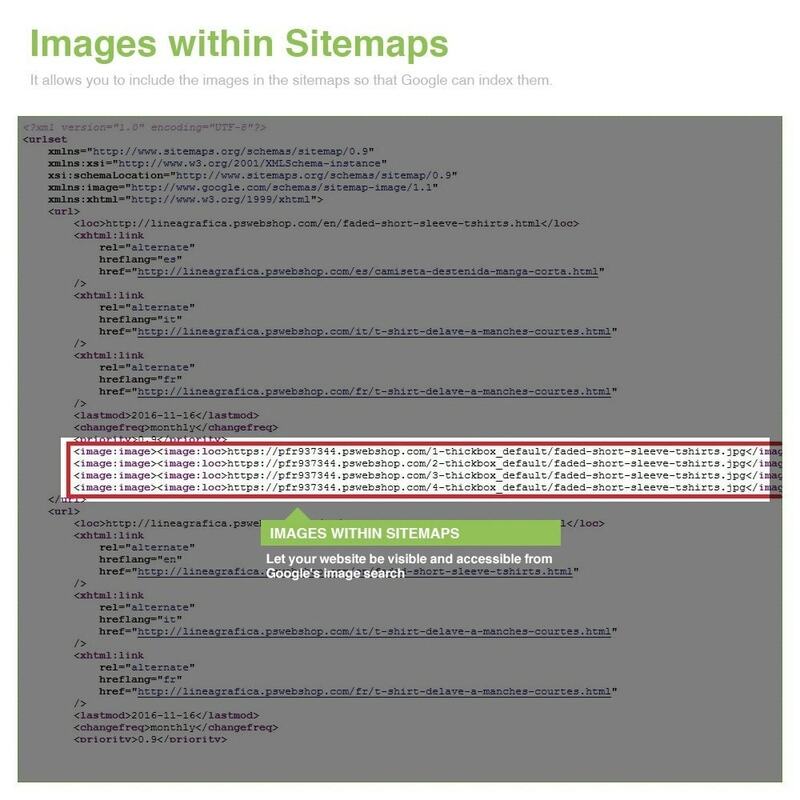 Google only accepts sitemaps that weights up to 10MB or 50,000 urls, this is why our module automatically split up the large sitemaps into several files so that you don't have any problems in Google. You will find inside the module a Cron URL that allows you to generate all your sitemaps automatically and on a regular basis without having to do anything. You just need to copy and paste this url into a Cron module or into your hosting panel to execute these tasks automatically and on a regular basis. This key tool for SEO allows you to submit to Google and other search engines all the URLs of your store and guarantee that their visibility is the best possible. 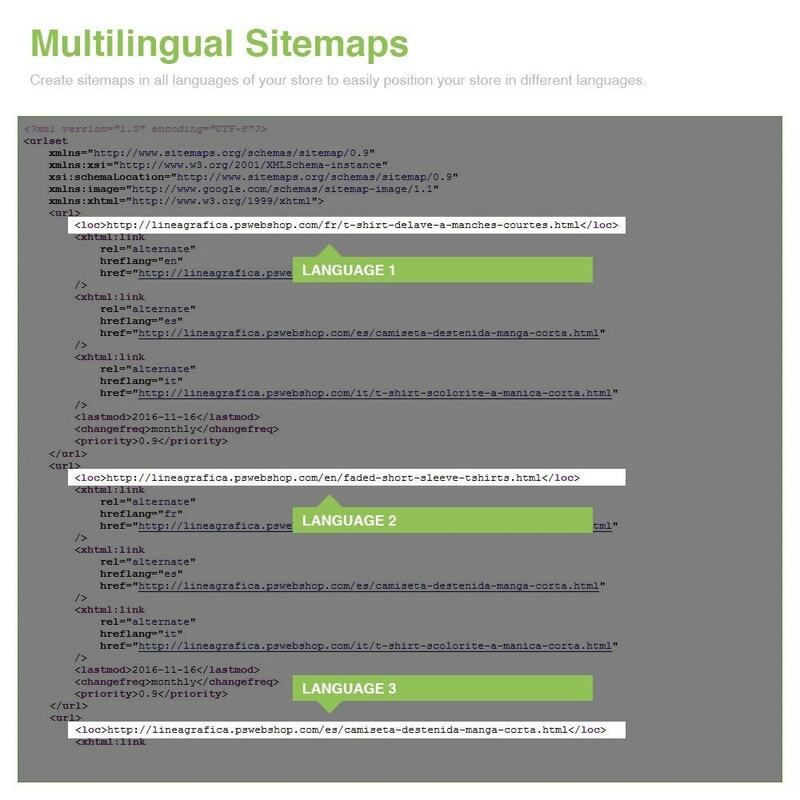 The Multilingual and Multistore Sitemap Generator allows you to index in a few clicks all the pages and all the product, category and manufacturer images of your stores (multistore) in all the languages (multilingual). 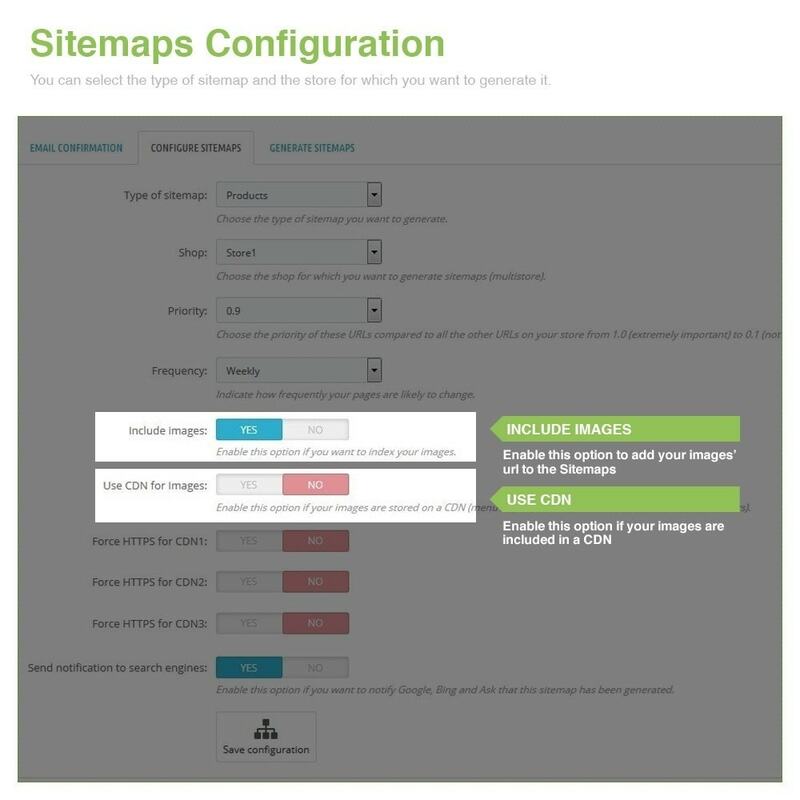 This way, the sitemaps will allow users to find your store on search engine, either from the general search or the image search. The multilingual and multistore features are a real plus and will allow users of different nationalities and with different needs to find your stores.